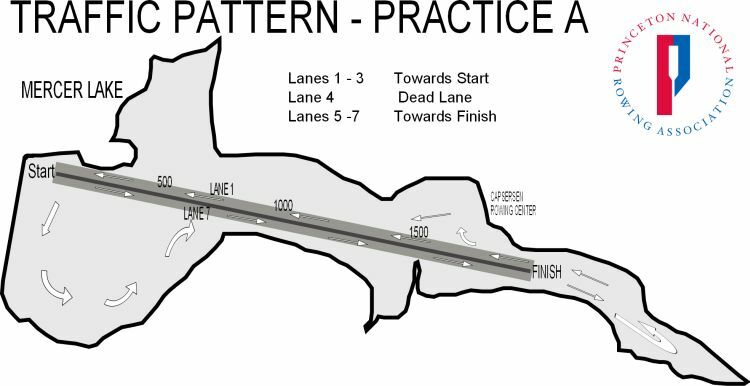 Lane 4 (the middle lane) is a dead lane and no shells shall row in that lane. The three lanes and area outside the course on the north side (Caspersen Boathouse side) shall be used to travel towards the start (west). The three lanes on the south side (Marina side) of the course shall be used to travel towards the finish line (east). The area east of the finish line shall be in a counter clockwise direction. The area in the wide part of the lake (west end) near the start shall be in a counter clockwise direction. Crews on the race course have priority over crews re-entering the course. Boats crossing the course must cross at a right angle to the course. Outgoing crews have priority over incoming crews. These traffic patterns may be changed during regattas or park activities. Rowers, Coxswains and Coaches should follow traffic patterns posted and in effect during these special occasions. Boats being overtaken must yield the right of way to the faster boat. Boats should not sit still on the course or at the ends of the course blocking other boats. If a coach needs to talk to a boat(s) or a boat needs to make adjustments, please move off of the course. All motor boat drivers shall keep their wash to a minimum when passing other boats. Crews should be prompt and efficient on the docks. Coaches should work together if they are planning special workouts requiring the cooperation of other crews. Boats violating these traffic patterns should be reported to the responsible coach. If there is no resolution, then the problem should be reported to Kristopher Grudt. All shells must be equipped with a bow ball and working heel ties. All shells that row in darkness shall have fixed, flashing lights bow and stern. Each rower should be aware of basic shell safety and check equipment before leaving the dock. Each coaching launch shall be equipped with a cell phone. Launches must be equipped with enough approved life jackets to provide one for each person in the launch plus at least two extra. Launches must be equipped with all equipment required by the United States Coast Guard and the State of New Jersey, including life jackets, a sound producing device for emergencies (horn, whistle, siren) and navigation lights (if used at night or dusk). In addition, each launch should carry a paddle and a safety throw line. All launches shall be licensed in accordance with New Jersey State laws. Each organization shall ensure the safety of its equipment. All rowers must know how to swim. Coaches should know the swimming abilities of all rowers. Swimming is not permitted in Mercer Lake. No rower under the age of 14 shall be permitted to row without a coaching launch. Junior and novice rowers and crews must be accompanied by a launch at all times. No rower or coxswain should ever leave a flotation device/boat to swim to shore. Be aware of weather forecasts and do not row in dangerous or unsafe conditions. No rowing in the dark. Boats on the water in twilight hours must have bow and stern lights. No rowing when air temperatures are below 35 degrees Fahrenheit. Coaches should be first aid and CPR trained. All organizations shall have a signed consent form for all rowing members in accordance with their organization’s policies. NO ROWING IS ALLOWED DURING A THUNDERSTORM (when lightening can be seen or thunder can be heard). All boats and coaching launches on the water will immediately clear the water by returning to the boathouse or the nearest safe location. No additional boats will be launched. Rowing is permitted to resume 30 minutes after the last thunder is heard. Coaches should check and be aware of any weather conditions forecasted or storms in the area during a planned practice or competition on Mercer Lake. The last crews returning to the docks in the morning or afternoon/evening, when there are no remaining crews on the water, are responsible for putting the “Goose Ropes” in place. All crews are responsible for keeping the area in front and behind their boat bays clean. Gasoline and flammable materials must be properly stored in cabinets built for the storage of this type of material. Rowers are encouraged to use reusable water bottles. Disposable water and beverage bottles must be disposed of properly and not left on the dock, the grounds around the boathouse or thrown in the water. Coaches are responsible for their team’s compliance with these Rules of Mercer Lake.